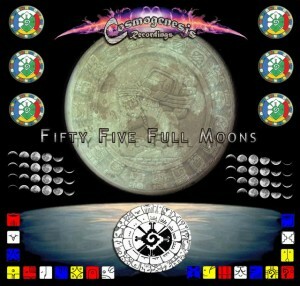 Cosmogenesis Recordings returns with another blasting compilation in honour of the full moon countdown to 2012. As with the previous release in this series, 55 Full Moons focuses on the full-on side of psytrance, a style marked by sizzling electric leads, explosive breakdowns, epic atmospheres, and pumping rhythms–all of which are designed for peak moments on the dance floors of the world. With contributions from artists representing Mexico, Russia, Thailand, and the UK, the sound is truly global. MP3 Download | WAV Download · Download count: 17,632. This work is licensed under the Creative Commons. In addition to the standard 320k MP3 and lossless WAV packages, Cosmogenesis has also released a special 24-bit WAV version which can be downloaded here. What a Killer Compilation ..
thanks for the compilation :) free music is unconditionally synthesized music, so we can say true music! Woooooowwww!!!!NAUGHTY,NAUGHTY…..HORNY!!! !I`ve knocked out from ground,when i was tuned up this compilation.Also i must 2 admit that,the LSD was right powered for the traxx,wortex status was w-4.0,and i were teleportated from Milky way the farest earth-like planet Darwin 15 for 4 min by earth time.Amazingly i`m professionally producing psytrance and full-on(Starting with goa-trance) in 1995-97,and this traxx are knocked me out like 3-rd grade child.Ayyyyaaaa….this tracks are really 2 much fucked up,man! !And i will tell you one secred connected with this comp.When i listened and r-mixed some of the trx,i had a vision that i`m seatled down with my girlfriend(she`s really great external and internal beauty) with i`ve strong relationship within years.So when my vision vinished,suddently she was come in my place,she was told me that SHE WAS HAVING THAT SAME VISION,WITH SAME TRAXX OF THIS COMP.IN SAME TIME WHILE I WAS VISIONIZED!!! !THIS COMP IS PSYCHED OUT!!! !STRONGLY RECOMENDET FROM EAST-EUR NO 1 PROJECT A.L.T.A.D.O.S.A a.k.a CIBER FUTURA a.k.a EL VASURA DE TIERRA P.S Soon i`ll release some r-mixes from this comp,maybe i`ll r-mixing all………..THE COMP SAVE MY LIFE,AND GINE ME 2 HARD PSYCHOTROPIC AND PSYCHOACTIVE NRG………………………………..THANK YOU MY PSYCHEDELIC MUTANT FRIENDS!!!!!! big probs, i like the spirit of sharing virtual space and freedom, we are the future! keep rockin, and keep on collabo trippin around the world! BOOOOOOOOOOOOOOOOOOOOOOOOOOOOOOOOOM! sik tunes and killa vibes. Madd props to Dj Sanuk aka Tight for his tremendus production help. That’s album is very good! I recomend ! Take care of it ;) this is the pure trance! thats a great psytrance copmilation with a very good track collection. the mastering sounds very good, too. what to say, I don´t know. hear it up and down! PUTA QUE PARIU! ESSE SOM É TENSO!!!! killer tunes and smokin vibes. Bonus! A new one – no doubt will be excellent as always – and Galactic Monkey too! Reeee-spect to all!